ROME – It is arguably the finest Baroque fountain in all Rome, if not the world—the most complex, the most beautiful, and the most thrilling. The monumental centerpiece of the finest piazza in the Eternal City, Piazza Navona, was constructed in1651for the Pamphilj family pope Innocent X, whose hereditary palace was in that piazza. Gian Lorenzo Bernini and his highly qualified sculptor assistants hacked, twisted and polished white marble and travertine from the quarries north of Rome into the Fountain of the Four Rivers. This amazing, four-legged confection—a quadripod rather than a tripod—resembles nothing so much as a mammoth candlestick supporting, instead of a candle, an ancient Egyptian red granite obelisk 16.54 m tall. Bernini’s conceit was that, beneath all the weight of the obelisk, the fountain structure would be transparent, permitting viewers to see right through the fountain, past splashing stone horses and drinking lions, from one end of the piazza all the way to the other. Such artistry comes at a price. For a fountain to function, water must run through a labyrinth of hidden pipes—and Rome’s water is notoriously dense with calcium, which can accumulate and block the flow. The stone itself is drenched with that water, but also with brilliant sunlight on summer days, alternating with mid-winter chills, when the occasional snowfall and not infrequent night-time freeze brings ice. Add traffic, and the result is cracks and fissures in the stone, erosion from particle pollution and smog, blocked water spouts, and, above all, risk to the supoprt system of the fountain itself. Comparative photographs taken in 1970 of the single figures representing the four rivers—the Platta, the Ganges, the Tiber and the Nile—demonstrated the extent of the damage. The cafe, restaurant and shop owners at Piazza Navona did not oppose the conservation project for the fountain even though it required unsightly scaffolding. However, they lobbied intensely for it to be completed within six months, she said, “But that sort of speed was impossible for the restorers in charge of the work, which we knew would take at least two years. “In fact, a certain amount of time was spent on arranging financing. But above all, a restoration or conservation building site on this scale can be an even more complex project than a new construction. When the restorers come upon a problem, they must stop and consider carefully the various solutions. This takes time and the contribution of a host of skilled specialists: architects, biologists, restorers, photographers, chemists for mineral analysis, hydraulic specialists.” In addition, all past restoration and conservation attempts must be examined and analyzed; even restorations that are not bungled or did not utilize materials no longer acceptable may need restoration. For the carved portions of the Bernini fountain, sophisticated tools were put to use, such as a colorimeter and a video microscope. The extent of the erosion, and the depth of the fissures and elongated cracks in the four carved figures representing the rivers, were analyzed using ultrasound and laser scanning. The hydraulic system was studied via endoscopy. In the portion where a figure represents the Ganges, photographs showed that in 1970 water emerged, as if over an invisible umbrella, from two narrow spouts and from two broad fissures that ejected sheets of water. “By 2006, water was escaping from the wrong place. The fountain was almost entirely blocked, and the mechanical action of the water then damaged an oar that was part of the group,” said Pandolfi (see photo above). To analyze possible calcium damage that would block pipes, black marble disks were placed strategically at different depths within the water basin, so as to measure the amount of calcium deposited over a specific time period. 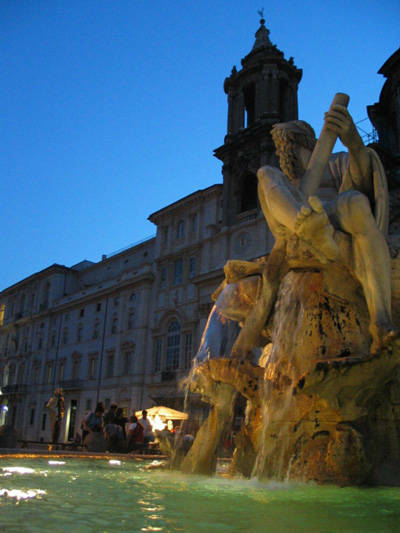 Once restoration is complete, smog, however, continues as a threat to the Four Rivers Fountain, as well as the numerous other recently restored monumental fountains in Rome, according to art historian Luisa Cardilli, speaking for the Rome city administration. Those recently restored include the Trevi Fountain (in 1999), the Fountain of the Turtles in Piazza Mattei, the Acqua Paola Fountain on the Janiculum and the twin basin fountains placed in Piazza Farnese by Michelangelo. One at particular risk is the Fountain of the Triton in Piazza Barberini, which has been restored four times in the past three decades. Even the few fountains outfitted with closed-circuit water systems require constant, careful monitoring and maintenance, said Cardilli.